When you are four years old in a twinkle toes class, you aren’t exactly thinking about how this dance class is going to affect your future. The only thoughts probably going through your head are how your mom has been gone for way too long and your shoes are super weird to walk in. Over the 14 years I spent at the YWCA School of Dance, I did not fully appreciate all the doors that dance opened for me, and the opportunities it created. Looking back, however, the reality of it is stark. Due to my growing love of dance, I tried out for my high school’s dance team. The Cane*ettes are a kickline style dance team that performed as a part of the Golden Hurricanes Marching Band. There, I danced with some of my best friends, even my current college roommate. If it weren’t for the YWCA School of Dance, I never would have had the dance foundation and the endurance to perform at football games every Friday night of the season for three years. Ms. Chris, the director of the school of dance was also the choreographer for my school’s musicals. She encouraged me to try out as a dancer in the musical during my freshman year. Four years later, I found myself as the lead of the musical, Legally Blonde. I owe my start to Ms. Chris’ motivation and teachings. 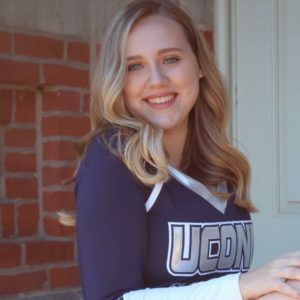 Now I am in college, where I perform for thousands at UConn’s football and basketball games with the UConn Kickline Team. Go Huskies! In college, the team is much more intense. The competition is fiercer and the tricks are harder. However, I always had confidence in my abilities because of what my teachers instilled in me when I was here at the YWCA. Even if you weren’t the best dancer in the room if you continued to work hard and try your best it was always enough. The YWCA didn’t just give me the skills to join the best kickline team in New England; it gave me confidence and perseverance to know that I deserved to be on it. Now that I am back with the YWCA yet again, working as an intern with the Communications Department, I continue to reflect on the time I spent here. It was a lot of time for sure. Over 14 years, I grew up in the YWCA. I took the tap, jazz and ballet classes, with Ms. Kayla. As I got older, I took lyrical and pointe as well. I became a student teacher, then a head student teacher. I was able to help teach many little girls, and boys, some of the basics of the sport I love. When I was little, I looked up to and admired so many of the older girls. I was able to become a role model to others as those girls were to me. When I entered the School of Dance, I was a little girl, still tripping over my own feet. When I finished my senior year, I left with friends, skills, and most importantly, the courage to face whatever would come next.